Did I study enough for this test? Won’t my friends do better than me? If I don’t get an A now, I won’t do well on the next exam, and then will I even get into a good college? Anxious thoughts such as these aren’t always just passing worries. They’re becoming deeply rooted, widespread mantras for young people across America. Anxiety is the most common mental health challenge that young people face, and it’s the top reason why students seek mental health services at college today. 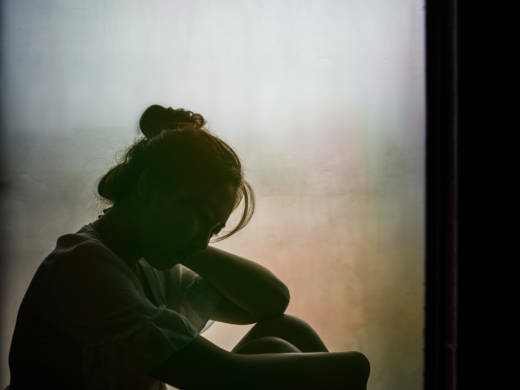 In severe cases, anxiety is stopping teens from doing homework, reaching out to friends, and even leaving their homes, and leading to depressive and suicidal thoughts. Many anxious teens have some sort of trigger: a school subject that doesn’t come naturally, the cliques they face at school, or — hovering throughout their high school experience — pressure to apply and get into college. It can be tempting for the counselors and therapists who work with these students to remove as many of these instigators as possible, allowing students to simply walk out of class when the content gets tough, or eat lunch away from the chaotic cafeteria. But those solutions don’t usually get to the root of the problem, and in fact they can make it worse. Instead, according a range of mental health experts, school counselors should focus on giving students the tools they need to overcome their anxiety, while fostering a school culture that embraces a sense of balance and self-regulatory skills. There are a number of factors contributing to a rise in anxiety among teens. Local community trauma, poverty, and continual reports of violence from around the world can frighten young people. Social media rarely allows teens to take a break from their peers. And in many middle- and upper-middle class communities, according to psychologist Richard Weissbourd, today’s most “potent ingredient” is “achievement pressure” — the pressure to excel across academic subjects and a wide range of extracurriculars, culminating in the stress of putting together an impeccable college admissions package. Underlying each of these factors, though, is the stark reality that many young people have too few opportunities to practice and build resilience, says counselor and educator Josephine Kim. More so than in past generations, many teens today have their basic needs met, and they haven’t had much practice making mistakes. Especially in affluent communities, their parents are hyper-involved in their academic and social lives, so it’s unusual for teenagers to study, arrange a meeting about a bad grade, or even resolve a disagreement with a friend without parental help. When an uncomfortable or difficult situation arises, many teenagers just don’t have the skills to deal with it on their own. Instead, they worry, envision the worst, and shut down. The good news is that schools are increasingly tuning in to mental health needs, and they’ve gotten better at diagnosing anxiety disorders, says school counseling expert and researcher Mandy Savitz-Romer. With that awareness, though, comes the question of how counselors should best support anxious students. Above all, it’s important that counselors teach students to overcome their anxiety, not to escape their triggers. Anxious teens often just want counselors to help them feel safe again — but their problems will likely only escalate if they don’t learn how to cope with stress, discomfort, and panic. O’Brien suggests that counselors start by isolating what specifically is making the student anxious, and brainstorm how to make that situation more manageable. If one class is the instigator, then the counselor can try suggesting that the student moves his seat, or talks to the teacher. These actions demonstrate to the student that he has some control over himself and his surroundings, a key factor to building resilience. During counseling sessions, O’Brien says, the student can practice strategies to calm down and refocus his thoughts — tools he can later use in anxiety-inducing situations. “Many students with anxiety want to avoid their trigger,” O’Brien says, “but counselors should expose students to what they’re fearful of, in a healthy way that won’t induce more panic.” Strengthening these self-regulatory skills such as prioritization, focus, and mental flexibility, researchers have found, is another fundamental way to develop resilience over time. Counselors should also set expectations for what types of accommodations students should expect, says Savitz-Romer, who is a senior lecturer at the Harvard Graduate School of Education (HGSE). Schools are increasingly designating safe, quiet spaces for students to retreat to when they are feeling overwhelmed. While this is a necessary support in many circumstances, counselors should also establish and communicate limits on how long each student can stay in these quiet rooms before she needs to return to class. Attending school and completing work needs to be the goal — not something to be avoided. Anxiety isn’t an individual student issue. School leaders and counselors are increasingly reporting schoolwide “anxiety epidemics,” with large numbers of students feeling too paralyzed to work, and stress being almost celebrated as proof of achievement. Counselors can partner with principals and teachers to foster a school culture that mitigates anxiety and fosters positive mental health. In more affluent, high-achieving schools, where pressure to excel can be debilitating, counselors can advocate for students not to overwork themselves academically. “Balance is important,” says O’Brien. If students appear particularly overwhelmed, she says, it may be best for counselors to suggest they take fewer AP or honors classes. Counselors can also encourage students to take part in outside extracurriculars that bring them “joy and a sense of self-worth” — feelings that can mitigate the stressors of intense academic work. If students are feeling especially burnt out and nervous about college applications, O’Brien says, help them consider and explore alternative routes to a four-year college: taking a gap year, or first taking classes at a community college. At the whole-school level, counselors can work with teachers to provide lessons on managing stress, prioritizing, and mentally switching between tasks, so that all students have an idea of how to handle feeling overwhelmed, suggests clinical psychologist Jacqueline Zeller. An evidence-backed curriculum on mindfulness and social-emotional learning can also give students, faculty, and staff shared terminology for labeling and managing their emotions, which helps ensure they’ll understand each other when problems arise.